Once upon a time, I had the good fortune to be traveling and playing golf in my favorite part of Scotland: the southwest. We were staying at Turnberry, home of my favorite course on the planet: the mighty Ailsa. Our itinerary called for making a day trip from Turnberry to Machrihanish on the Mull of Kintyre, another world-top-100 links course. Only we wouldn’t be getting there by car or coach. We’d be traveling as the crow flies, over water, aboard what I decided at the time was the best invention since the dimple: a 12-seat fast RIB called The Kintyre Express. A trip that would’ve taken 5 hours by land was over 90 scenic minutes later when we arrived at the boat’s berth in Campbeltown. 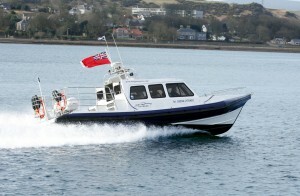 And after our highly enjoyable round at Machrihanish, we hopped back aboard her for the return journey to Turnberry. Colin Dalgleish, whose PerryGolf company was hosting the trip, suggested we stop by the charming coastal town of Rothesay on the island of Bute — just for a quick pint. There being no objection to the idea, we did. We may have had more than one as I recall, but in any event, when we emerged from the pub, the sky had darkened and a black shelf cloud was sweeping toward us from the south. As we boarded the boat for the return journey to Turnberry, I felt the first drop. It was the size of a not-so-wee dram. Seconds later, the deluge hit. Wilson Smith, the boat’s able captain, seemed as awestruck as we were by the sudden change in weather. Bolts of lightning and cracks of thunder rent the air around us, as the sea — even in the sheltered harbor — grew rougher and rougher. For a while, I thought we might be bedding down on Bute rather than returning to the comforts of the lodges at Turnberry. But Captain Smith steered us homeward, pausing to wipe the condensation from the windshield every minute or so because the defroster couldn’t keep up. We landed that night in Troon, the boat’s home port, since the harbor at Turnberry was too small to take on in that weather. But we arrived, safe and happy and tired. The Kintyre Express had worked its magic that night just as surely as Machrihanish had that afternoon. And I made a promise to myself that I’d ride her again someday. Fast-forward a decade or so to 2011. 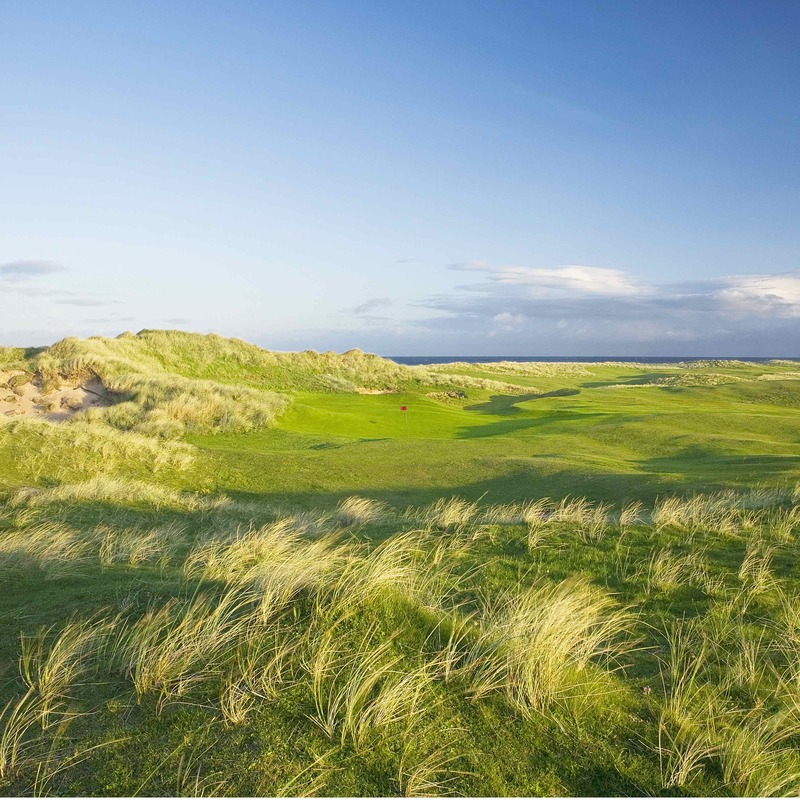 Today, Machrihanish has a celebrated new neighbor: Machrihanish Dunes Golf Club, a David McLay Kidd design that has been called the world’s most natural golf course. 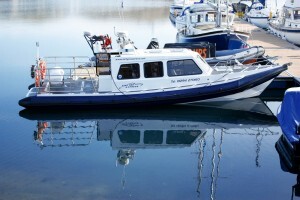 And the Kintyre Express now has a sibling boat making trips from Campbeltown to Ballycastle in Northern Ireland. And you know what lays in that direction, don’t you? Yes, that’s precisely right — Royal Portrush. And Portstewart. And Castlerock. And Royal County Down. And Ballyliffin. From dock to dock, it’s 90 short minutes from Campbeltown to Ballycastle and the links golf Nirvana on the Irish side of the sea. Beginning to see where this story is headed? Imagine a links golf itinerary that goes something like this. You fly into Dublin. Play a quick round at Portmarnock or Royal County Down — just as a warm-up. You spend the next day marveling at the twists and turns of Royal Portrush. Or enjoying the spine-tingling view from the first tee at Portstewart. Then you mosey across the border into Ireland, Republic of, to take on the twin 18-hole masterpieces at Ballyliffin before returning to spend the night at Bushmill’s, where fine dining and fine whiskies pervade. In the morning, you catch the boat at Ballycastle and enjoy an adventurous ride to Campbeltown on the Mull of Kintyre, where Machrihanish Golf Club and Machrihanish Dunes await. You spend a few nights in the Ugadale Cottages at the Village at Machrihanish Dunes, cottages so luxurious they were named Hotel of the Year (small hotels/guest houses category) by Golf Tourism Scotland in 2010. And when you’ve had your fill of golf on the Mull, there’s another Kintyre Express ready to whisk you from Campbeltown over to Troon. And you know what awaits you over Ayrshire-way, don’t you? Aye, laddie. Royal Troon. Prestwick. Western Gailes. Dundonald. And the 36 holes at Turnberry. In one breathless paragraph, I’ve just listed 14 of the finest links golf courses you will ever set foot on. Courses so revered for their prolific challenges and unforgettable scenery that to play any one of them could be considered ample reward for a life well lived. 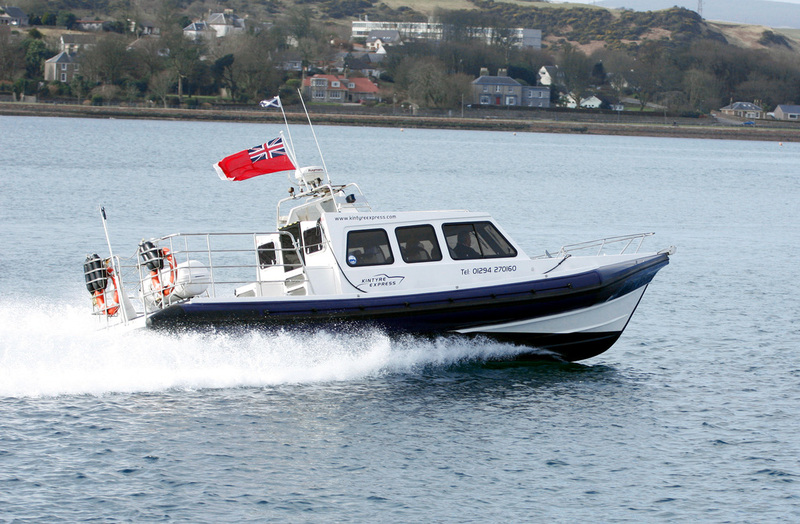 But thanks to a modified rescue-service boat, a craft redesigned with the “express” purpose of making links golf lovers’ dreams come true, these courses can all be yours. On the same trip. With minimal driving. In future posts, I’ll share my impressions of each of these incredible courses. For now, just know that the Kintyre Express recently announced that it will continue to operate its Campbeltown-to-Ballycastle route year-round. So if you haven’t had your fill of links golf yet this year, there’s still time. Check out their schedule at www.kintyreexpress.com.